Oooo, stuff from the surprise box is always great, isn’t it? 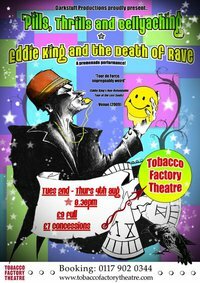 Just agreed to join the merry crew taking part in Darkstuff Productions’ “Thrills Pills and Bellyaching – Eddie King and the Death of Rave” at Bristol’s Tobacco Factory on Aug 2-4th at 8-30pm. This is gonna be a great show! Come celebrate one final night at a warehouse rave on the verge of oblivion where innocence is lost, memories are made and faith wavers. Another decade, another time, another Eddie and all is not as you might think. Join Eddie and his fellow rave-goers as the lost find each other for a moment and life frays at the edges. Following two successful Eddie King events Darkstuff Productions returns to the Tobacco Factory Theatre with a whole new twist in the tale and a host of delightfully dark monologues. A night of new writing from Simon Harvey-Williams, Phil John, Gill Kirk, David Lane and Helen Parker, inspired by the euphoria-driven age of Rave. An age arguably the last great social happening of the Twentieth Century – an age before Facebook. The Acid Generation. Were you there? Are the memories stirring? Did Eddie King, that famous everyperson, overdo on the little pills and fry his brain? Whether you’re a veteran raver, someone who wasn’t there the first time around, or an intrepid theatre explorer come plumb the depths of a dizzyingly exhilarating era without the morning-after headache. This is not a rave. Busy – and good – times. The summer’s being spent Getting Things Done: completing a three-hander for the Theatre West competition for their autumn season at the Alma Tavern Theatre in Bristol; trying to get a final good first draft of my long-unwritten ‘fertility play’; polishing a collaborative comedy script with a great friend and squeezing in the day job wherever I can find a gap. Away with the Fairies, the Theatre West submission, was shortlisted alongside some work by writers I regard very highly, so I’m very happy indeed to have got that far. More info on Fairies under ‘Scripts & Shows‘. There will be a script-in-hand performance at The Alma in the coming months. Other things are afoot, but more on those at a later date! Meanwhile, Water’s Not So Thick appears at the Ustinov on Wednesday 22 September, at 12:30. Tickets just £3 – book yours now! Best experience as a writer so far was had this week. 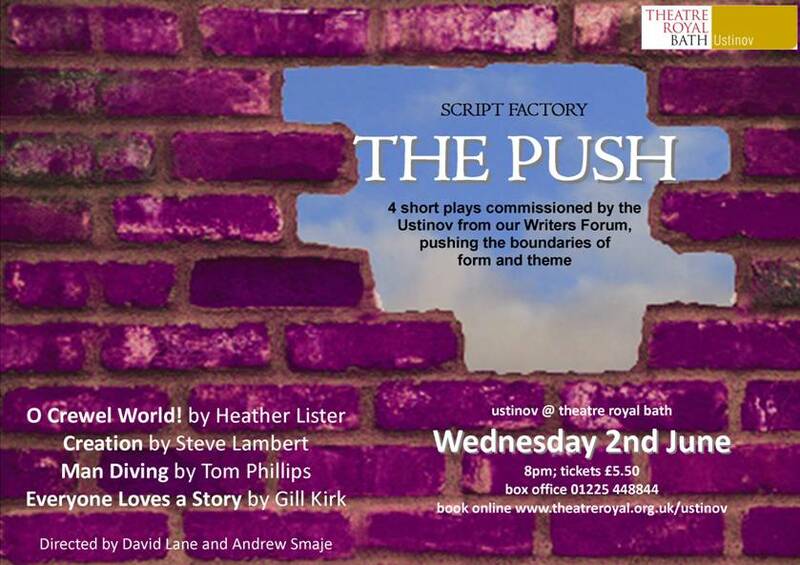 My absurd short play, Everyone Loves A Story, was one of four staged readings in ‘Push’, a night of newly commissioned pieces at the Ustinov, Theatre Royal Bath. I was tested, pushed and pulled every so gently by David Lane’s superbly questioning dramaturgy in the two weeks leading up to rehearsals. We had the day of the show to rehearse. David was directing a thoughtful, up-for-it and very strong ensemble cast (Rob Benson, Rachael Fagin, Adrian Harris and Louise Wright). There was a strange moment when I realised they were discussing and debating the script in the way I’ve done when I’ve been performing; i.e., taking it seriously! This script was the last of the night to be performed – there were three pieces beforehand (from Steve Lambert, Heather Lister – both directed by the Ustinov’s Andrew Smaje – and Tom Phillips, also directed by David Lane) which were so powerful and different that by the interval, I was very nervous – could ours stand up against those? My worry about this piece is that the dialogue and action risk being confusing if the audience doesn’t go with the idea of participating and doesn’t enjoy the dark humour: then you risk leaving the cast pushing against a closed door – not much fun. The smashing people at Bristol Folk House have picked The King Was In The Counting House to be one of their short rehearsed readings on Saturday 8th May, at 8pm. There were over 200 submissions, and the night will regale the audience with a happy six winners’ scripts. It’s only a fiver (which gets ploughed straight back into BFH’s great work) – call 0117 926 2987 for a ticket!